DONALD Trump will be urged to avoid central London and meet with Theresa May at her Chequers retreat in an attempt to divert him away from inevitable protests in the capital when he visits the UK in July, it has been claimed. Sir Kim Darroch, the British ambassador to Washington DC, will present two proposals to the Republican firebrand, one for a London visit and one based around the Prime Minister’s country retreat. But the ambassador will make it “very clear” the UK Government will prefer the second option, according to a senior Whitehall source. 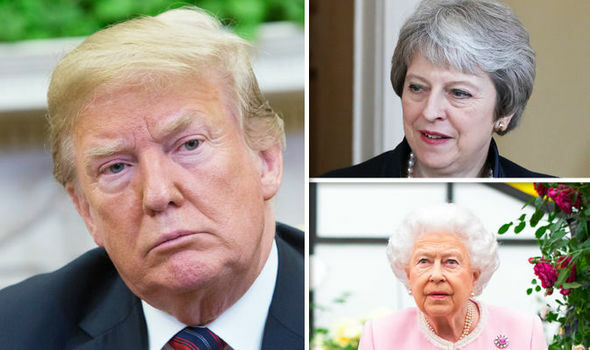 As part of the Government’s efforts to steer clear of the capital, it is also understood Downing Street will suggest the President has tea with the Queen at Windsor Castle instead of Buckingham Palace. It is also understood the billionaire will visit Blenheim Palace in Oxfordshire to visit the birthplace of Winston Churchill. Trump was confirmed to be arriving in the UK on July 13 by Sir Darroch back in April. The visit to Chequers will be pitched to the Republican firebrand as one of the most “presidential” things he could do while visiting the UK by officials. Former president’s Dwight D. Eisenhower, Richard Nixon and George W. Bush have all visited the retreat. In an effort to solidify the special relationship between the UK and US, Trump will have dinner with Mrs May. Trump is also set to play golf during his time in the UK – the Foreign Office is putting together a list of potential sporting partners for the President. A military event is also expected to take place with an inspection of US-made F-35B Lightning jets used by the RAF or a visit to the HMS Queen Elizabeth aircraft carrier in Portsmouth looking like two of the most likely options. It is currently unknown whether Melania Trump will join her husband during his visit to the UK. ← Chuck Todd Calls Out Bill Clinton: ‘It Galls Me’ He Never Apologized to Monica Lewinsky for ‘Ruining Her Life’ [VIDEO] ← David Hogg Calls For Perpetual Trolling Of President Trump: Gets SCORCHED!